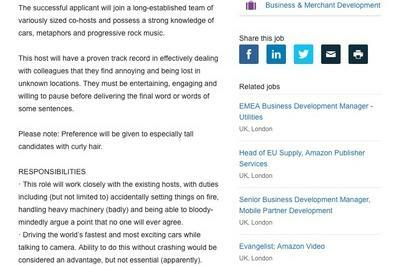 Amazon rarely gets to show off its sense of humor, but it was on full display in a recent job posting on its website. 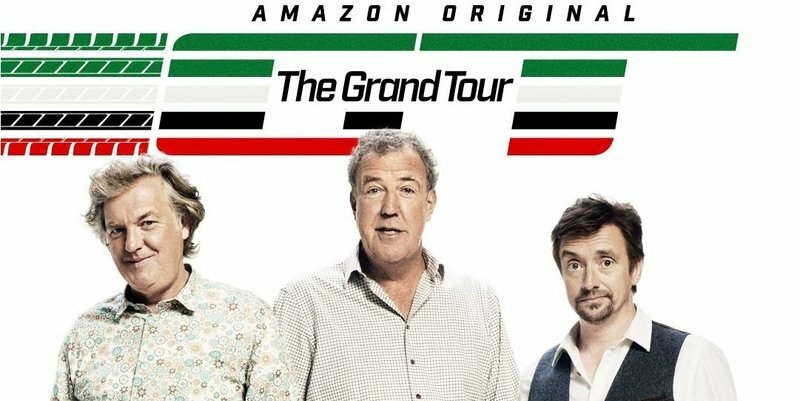 Turns out, Amazon Prime Video is in a mad search for a new TV host to fill in temporarily and cover what it describes as “an absence due to pneumonia.” You don’t need to be super sleuths to figure out that this listing is nothing more than a tongue-in-cheek jab at The Grand Tour’s own Jeremy Clarkson, but we’ll go along with it because the ad is actually pretty funny. If you think you have what it takes to join a “long-established team of variously sized co-hosts,” then, by all means, throw your name in the hat. Just remember that before you do, you’re going to have to pass certain qualifications, including, but presumably not limited to a “strong knowledge of cars, metaphors, and progressive rock music.” Likewise, you’ll need to possess unlimited amounts of patience, particularly when you’re dealing with annoying colleagues, and be willing enough at least to “pause before delivering the final word or words of some sentence.” Oh, and if you happen to be tall, have curly hair, and a predisposition to wear an inordinate amount of pre-washed denim clothes, you’ll have the inside track to landing the job of your dreams. Just be sure that you also have a valid driver’s license, a good grasp of British English, including advanced qualifications in “exaggeration and braggadocio,” and most of all, a social media platform with at least 6.5 million followers. Think you’re up for it? What’s the latest on Clarkson anyway? It’s been a few weeks since we learned Jeremy Clarkson would be out indefinitely from The Grand Tour because of a bad case of pneumonia. Since then, we’ve gotten sporadic updates of his condition, though he did reveal that his illness was serious enough that it could’ve killed him. No joking there. You’ll need to possess unlimited amounts of patience, particularly when you’re dealing with annoying colleagues. The good news is that he’s out of the hospital and is recuperating at home, so he seems to have skirted a meeting with you-know-who for the time being. The bad news is that, according to Jezza himself, he’ll be out of commission for the next two months as he continues his recovery from the more-serious-than-we-thought bout with pneumonia. We certainly wish the best for Clarkson. Pneumonia is no laughing matter, even if he himself has joked about it in the past. It’s good to see that he still has his sense of humor intact. He wouldn’t be Clarkson if he stopped dipping into his oftentimes juvenile sense of humor, sometimes at his own expense. Props also to Amazon for trying to make light of his absence after his health scare. It’s hard enough to see your multi-million investment fall to a sickness like this. At the very least, it’s good to see it stick with its guy through his ordeal, while also showing off a side of itself that we didn’t know existed in the first place. Who knew that Amazon up to posting a mock job posting like this. It makes me think that it might not have been Amazon who actually posted the listing. I mean, just reading the language of the post reminds me of someone who may have giggled his way to his 8 P.M. bedtime after writing it. Seems like something James May would do, right? 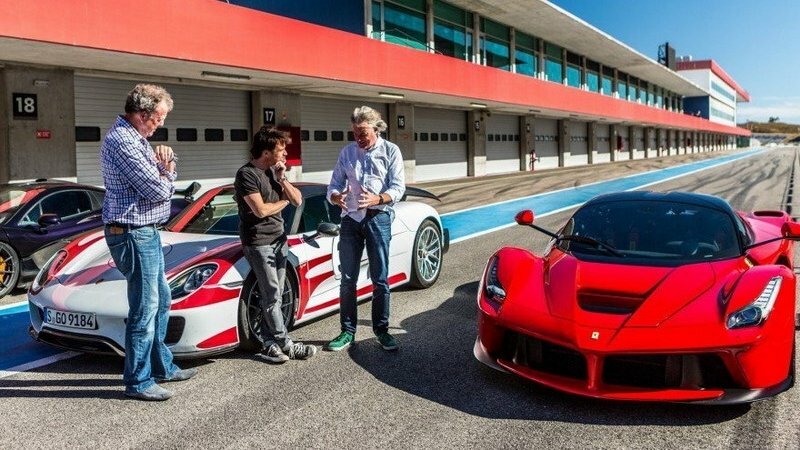 Read more news on the The Grand Tour.